Part II of "A Puck Drops"
In the Northern Alberta community of Grande Prairie during the period 1918 – 1945, hockey stickhandles from village to town, from one world war to another and between a recession, the roaring twenties and a worldwide depression. . Episode Two of “A Century of Grande Prairie Hockey covers twenty seven years. Bookends for the Episode are the termination dates of the two deadliest conflicts in history. This period coincides with the life span of one of the Peace Country’s most colourful buildings: the Wapiti Arena. It was constructed in 1919 and condemned for use in 1946. This time frame is remembered for an epidemic, a short but serious recession and a period of economic recovery characterized as the Roaring Twenties. The Roaring Twenties came to an abrupt halt with the onset of the Great Depression that crippled the Canadian economy until WW11. Recovery from the depression was slow but steady resulting in the maturing of a region that became a remarkably productive agricultural oasis at the northern latitude known for its boreal forests, short summers and frigid winters – ideal hockey country. South Peace Regional Archives: July 1919. 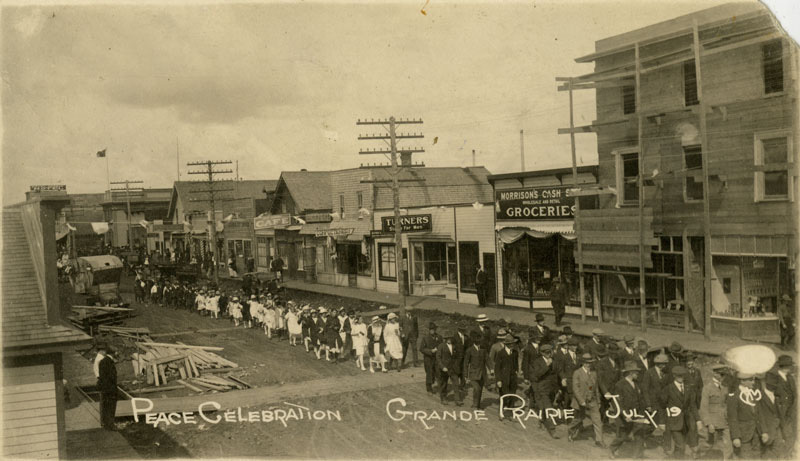 During this twenty-seven year period Grande Prairie graduated from a village with fifty inhabitants to become a town numbering 1,040 in 1919. Original log buildings, some preserved at the local museum were replaced by larger more comfortable frame homes with sewer, water, electricity, telephone service and access to amenities available in cities further south. Some trapping continued but agriculture remained the principal economic driver. With the proving up of homesteads wheat, oats, and other agricultural products captured world records for their quality bringing international attention to the region. This in turn attracted more people and stimulated growth and development in areas such as logging some coal mining and a thriving business community that served a large hinterland. Economic recovery in the Peace River Region and Canada in general was accelerated by WW11 given the need for both produce and other goods in Europe. 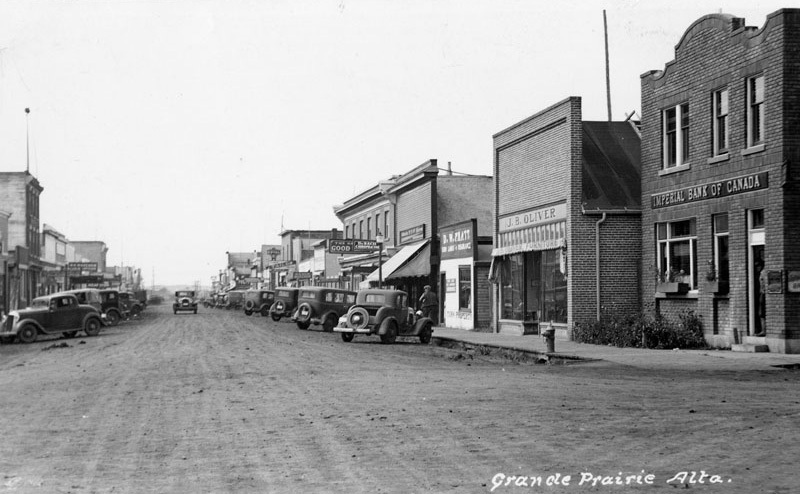 By the end of WW11 in 1945 Grande Prairie’s population had doubled to more than 2,000 – Alberta’s fifth largest and most vibrant community. 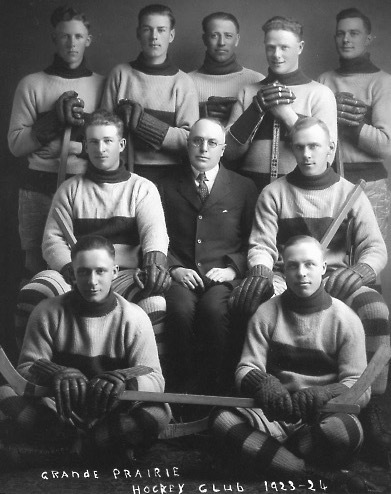 Many unpredictable events, economic, social and cultural accompanied the war including an unusual chapter in Grande Prairie hockey: the first successful hockey leagues in the north were established, hockey became recognized as Canada’s National sport, the first Grande Prairie Hockey Legends were born and Grande Prairie hockey players made their mark on the world’s stage. On Nov 11, 1918 Germany signed the Armistice that heralded the end of WW1. Unlike WW11 as we will see later in this episode, there is no record that hockey was played overseas during the First World War. At home, skating and hockey scrimmages would certainly have taken place on lakes and ponds but there is no record of these activities. For hockey players who enlisted and went overseas the war interrupted their game and they returned home following the signing of the Treaty of Versailles to an economic, social and cultural milieu that had changed in many ways. As noted above they left a village (population - 50) and in 1919 the town numbered more than two thousand people. Of particular note by the end of the war Canada had established its unique identity: an identity that cast aside the notion that it was a colony within the British Empire. As late as WW11, Canada’s independent status was unrecognized by many backward looking English citizens. However, Canada’s refusal to integrate their troops into the British Armed Forces in WW1 and the Canadian Army’s subsequent defeat of the German’s at Vimy Ridge should have put the British on notice that Canada was a nation in its own right and that its citizens had characteristics quite distinct from the British. Following WW1 homestead improvement deadlines were cancelled for soldiers joining the war effort and many returned home to resume the task of proving up their land after the war. Time and resources for play was limited but the revival of hockey after the war is proof of the human need for play and recreation. Hockey had to regain the toehold it had established before the war and the Wapiti Arena that was ready for use in 1919 provided a focal point for that recovery. Through economic ups and downs hockey not only survived but stubbornly grew to become an important aspect of our Canadian identity flourishing along with the country’s social, political and economic growth. The story of hockey in Grande Prairie bears witness to that reality. The boreal forests surrounding the town were gradually pushed back as new comers took advantage of benefits provided by the 1917 Soldier Settlement Act that included the offer of a quarter section of land and $2,500 interest free loans. Although it was some time before electrical power and running water were available throughout the town both water works and electricity came to Richmond Avenue in 1917 and a phone system was installed in 1918. Newspapers announced that Grande Prairie was one of the great cities of the west. In 1919 alone 124 new buildings sprouted. One of those structures was the memorable Wapiti Arena. By 1920 the town’s population was 2,500 with a Town Hall, Council Chambers and a Fire Dept. Later the Fire Dept and volunteer firemen played an important role in maintaining ice surfaces throughout the town. They would hook up the pumper trucks to hydrants and flood outdoor rinks scattered about the town. Residential areas rippled outward in every direction from Richmond Avenue, the town center. A two story red brick school Montrose Public School and later a High School was constructed. For many years an outdoor rink with boards and a shack that provided a bit of protection from the elements was maintained on the school grounds. It was the first public skating and hockey facility in town and along with lakes, ponds, Bear Creek and the Wapiti Arena there were adequate ice surfaces to support hockey at all levels after the war. Merchants of every kind including banks sprang up along Richmond Avenue. The Grande Prairie skyline featured a water tower - below it the Wapiti Arena and the first in a growing number of grain elevators sprouted in the background creating the town’s skyline. Institutions providing social, educational and health services evolved to support the rapid growth of the town and the large hinterland that depended on Grande Prairie for services. 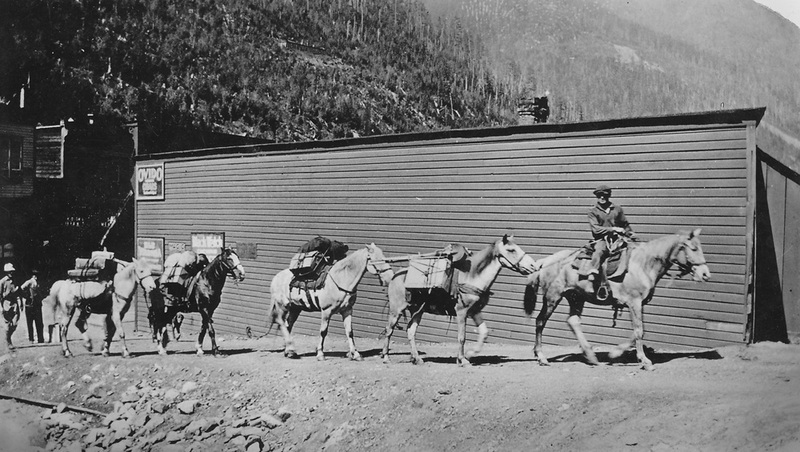 Perhaps the most revolutionary of all of the changes that met veterans returning from WW1 were changes in transportation. Above all else transportation was a “game changer” for Grande Prairie and the north. Development witnessed during the almost three decades covered by this episode would not have been possible without the transforming effects of the locomotive and horse power on the hoof replaced by horse power under the hoods of cars, trucks and tractors. More than anything else the arrival in Grande Prairie of coal-powered locomotives with their distinctive whistle and belching smoke and steam opened the north. 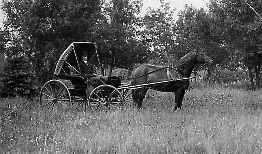 This was accompanied by networks of roads connecting communities in the north to one another and a highway to Edmonton that replaced the historic Edson Trail. When the veterans returned cars and horses shared roadways and garages began to replace livery barns. In 1919, horses were still the principal source of power on the farms but the appearance in that year of the first mechanized binders foreshadowing the displacement of horses. As well, improved roads and automobiles forever changed hockey expanding the range for competition between communities. Air transportation was not far behind rails and roadways. The coming of the airplane was associated with names such as Captain W. R. (Wop) May, “Punch” Dickens and Grant McConachi. Wop May stirred up excitement by barnstorming summer fairs as early as 1919. In 1925 “Punch” Dickens landed a plane on Bear Lake carrying mail from Edmonton when the train was unable to make its scheduled run. Further mail delivery runs by air came about in 1935 after a flood along Slave Lake washed out the tracks. It was Grant McConachie, President of United Air Transport who came to the rescue. Later that year passenger service was established and the following year a Government contract was awarded for the regular delivery of mail by air. A license for an airport was issued in 1937 cementing Grande Prairie as the communication hub of the north. In 1941 fifty thousand dollars was spent on buildings at the airport and Grande Prairie became the major northern base for aircraft and airmen during WW11 and a major pillar supporting construction of the Alaska Highway. Along with transportation Grande Prairie also developed as a communication centre with the north county’s first newspaper – the Grande Prairie Herald established in 1913 followed twenty-four years later with the arrival of CFGP the northern most radio station. Grande Prairie had it all. Two events stifled enthusiasm that should have accompanied the end of WW1 and the return of veterans from overseas. First was the Spanish Flu epidemic that made its appearance in Canada and the Peace country in 1918 along with returning soldiers. In Europe Governments imposed some censorship about the deadly disease but the effects were quickly apparent in Canada as the soldiers returned home. What was to be done – prevent the boys from returning? – Hardly. Quarantine was ineffective, medical staff and services were overtaxed and at least two mass graves were reported. Like a spell of nasty weather the flu affected everyone. At a family and personal level it brought crushing grief and along with social and economic upheaval the effects of the epidemic extended well into the 1920s. During the height of the epidemic all but essential services were cancelled and decreased demand for goods and services and work force shortages resulted in the loss of business. Another and partly concurrent event that curbed post war optimism was a recession in the early 1920s. Migration into the Peace at this time slowed and some homesteads were abandoned - one of the only times in GP’s history that the population declined. The recession was principally due to a sharp reduction in wheat prices. The reduction was such that the Peace country’s most important commodity – wheat – was all but worthless – not worth the cost of transportation to outside markets. Both the Spanish Flu and the recession handcuffed the development of hockey in the early twenties. However, this recession was relatively short lived. The economy rebounded quickly and flourished during the remainder of the Roaring Twenties until the Great Depression a decade later. The Peace Country in general and Grande Prairie in particular enjoyed surfing on the economic and social wave of the Roaring Twenties. 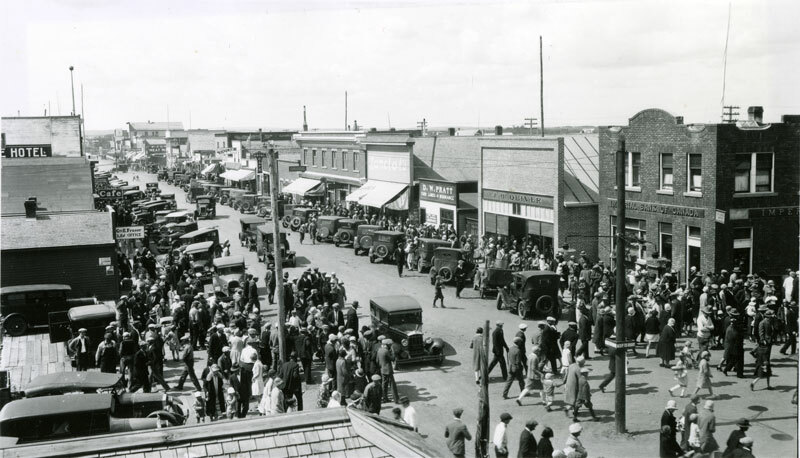 Local industries surged in Grande Prairie during the Roaring Twenties but agriculture remained the area’s economic mainstay. Names such as Trelle, Cochrane, Clubine and Alsopp brought attention to the Peace Country by winning top honours at international agricultural fairs for the quality of wheat, oats, alfalfa, timothy and peas they produced. The Roaring Twenties economic boom in the Peace culminated in a fact-finding mission to the north by John Imrie, Publisher of the Edmonton Journal. The mission resulted in a series of influential promotional articles and a book entitled, “An Empire In the Making”. Along with economic growth and social change that occurred hockey also flourished during the Roaring Twenties. The NHL, founded during the latter months of WW1 inevitably became recognized as our National sport and the country’s major winter pastime expanding into the US during this period. Some contend it was the Golden Age of sport. 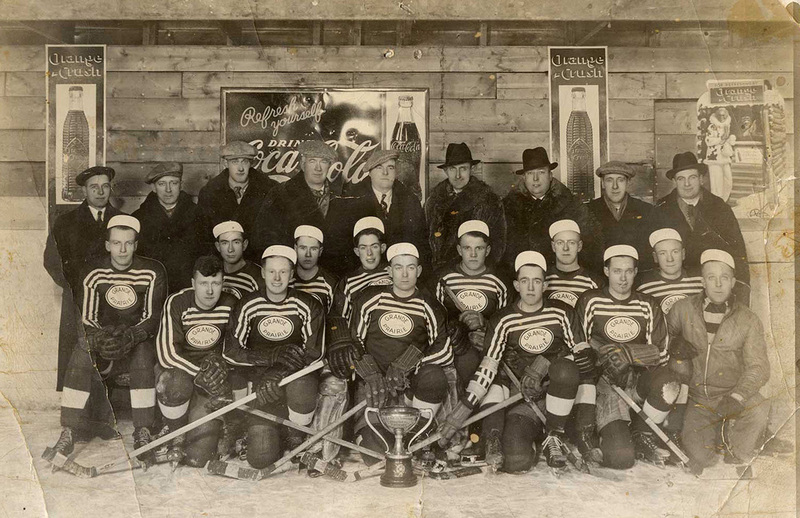 In this article we favour the period following WW11 as hockey’s Golden Age in Grande Prairie. Interestingly nine of twenty-one Legends were born during the twenties. Their early development took place during the height of the depression. The Roaring Twenties came to a rude end with the Great Depression that invaded every area of life. The depression hit with explosive suddenness in 1929 and ended almost as quickly a decade later with the beginning of WW11 in 1939. During the depression unemployment reached thirty percent, wages plummeted and in rural areas two thirds of the population were forced to rely on Government assistance. Unlike the early 1920s recession recovery from the Great Depression a decade later was slow and painful – like a sprinter struggling to break out of the blocks and reach the finishing line while dragging a millstone. Episodes of violence by frustrated unemployed workers were reported. The role of women as managers of household budgets was especially important with husbands earning little if anything. Women were soldiers in the trenches holding the line. Quarters, dimes, nickels and even pennies were in short supply. “We could go to the Waffle Shop, a little restaurant on Richmond Avenue where they sold penny candy including jaw breakers and bubble gum but even pennies were in short supply so trips to the Waffle Shop were few and far between.” (Ron Neufeld). Would be hockey players lacked access to resources needed to buy equipment, pay for ice time and travel to other towns. However, the will to play was powerful and hockey continued to evolve albeit at a slower pace with heavy reliance on outdoor ice surfaces. Skates and other equipment were shared between family members with stories of kids wearing several pairs of socks or stuffing the toes of skates shared by older siblings. With limited resources kids spent time clearing snow from the ice on outdoor rinks and ponds rather than spend money on admission to the rink. W Taylor, Frank Donald, J. Third, H. Obrien, F. Schenk, J.E. Basted, L.C. Porteous, H.F. Hammond, J.E. Shields, H.A. Brick. A trio of family names, (Bessent, Turner and Henning) show up in Grande Prairie during the 1920s: names of early volunteers who were instrumental in supporting the development of minor hockey and were prominent throughout this episode. 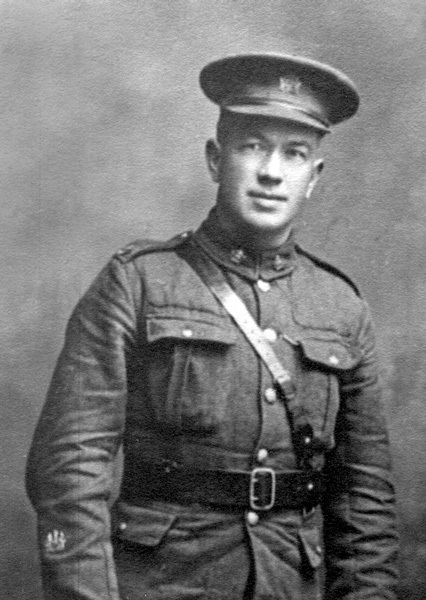 Following military service during WW1, Bert Bessent moved to Grande Prairie where he met and married Elsie Roberts. Elsie’s Father rode into the Peace Country on horse back to take up a homestead on Bear Lake and his family joined him in 1910. In 1925 twin boys, Billy and Bobby were born to Elsie and Bert. Everybody in Grande Prairie knew the two small, vivacious but mighty twins, Billy and Bobby who were active in baseball, hockey, and boxing. For spending money they sold newspapers on the main street. They would pick up their allotment of newspapers coming to Grande Prairie by train and fend off boys much larger than themselves to gain and hold the best corner on Richmond Avenue. Working as a team one would fight off the competition while the other ran to gain the prime location to sell papers on the street. As far as we know Bert’s interest in hockey developed because it was the favourite winter activity of his sons. However, Bert became much more than a dedicated hockey Dad. Hockey was like a magnet and clung to him like Velcro for the rest of his life. His influence spread far beyond his sons – to their friends and to the administrative and political machinery on which the sport depended. Bert was a skilled organizer and highly instrumental in establishing the cornerstones for minor hockey as we know it today. As a salesman he owned one of the few cars in town and along with coaching and managing minor hockey teams he provided transportation enabling the twins and their friends to play against teams in outlying areas. Bert Bessent sitting on his running boards with one of his many cars. Insight into the wit and spleen of the twins is apparent in one of their father’s adventures. 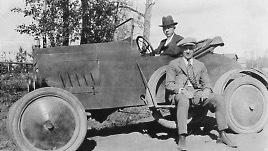 In 1928 Bert set out by car from Ft. St. John to Edmonton making the trip in twenty-six hours. We are not told what was the purpose of the trip if there was anything other than his will to set a record and bring attention to the Peace River country.. The road at that time was a winding dirt and gravel trail with only current driven ferries at major river crossings such as the Peace and Smokey Rivers. From Grande Prairie the road wound past Sturgeon Lake, through the villages of Valleyview and High Prairie, twisted tortuously past mink farms and fishing villages along the shores of Lesser Slave Lake and from there to Athabasca Landing, Westlock and finally Edmonton. Making the trip at that time along that route in twenty-six hours was considered a remarkable feat. For sensible travelers it was a long two day journey. His record stood for many years. Bert Bessent preceded Johnny Macdonald as a hockey volunteer and if we had more information it is likely that his name would stand along with Johnny as the Father of Minor Hockey in Grande Prairie. Unlike Johnny, Bert did not play hockey but we know that as his twin boys Billy and Bobby moved through childhood and adolescence minor hockey flourished under his leadership. He gave unstintingly of his time and resources and provided leadership by mobilizing the efforts of other volunteers. Due to his interest and action he moved Billy, Bobby and their peers such as Max Henning, Fran Tanner, Bob Card, Herb Shields and through the minor ranks to senior hockey. As a coach, Bert’s name is associated mostly with teams in the midgets category. Bert’s Midgets as they were called played against teams in Hythe, Clairmont, Sexsmith, and the Five Mile Creek School. Among the parents who worked with Bert were other automobile owners, Johnny Shields, Jack Mantle and Jack Crummy. Providing transportation was a big deal but they did much more than provide transportation such as coaching and refereeing games. They had no idea how far reaching their efforts would prove. The young people with whom they were working became the bricks, mortar and muscle for the Golden Age of Hockey following WW11. Turner is another name that shows up in Grande Prairie shortly after WW1. Hockey Legend Charlie Turner Jr. (see biography in player category) was perhaps the best know and most popular hockey player of his era in the Peace River country prior to and immediately after WW11. Following WW1 Charlie’s parents came to Calgary and later moved to Grande Prairie where his father started a construction business. Charlie Jr. was born in England in 1917 and upon moving to Canada started skating at age seven on a backyard rink his Dad maintained all winter for his son and other hockey-playing friends in the neighbourhood. At age sixteen Charlie Jr. was playing senior hockey in town. Like Bert Bessent, Charlie Sr. was a huge booster of the game. Charlie Sr. shows up as late as Boxing Day, Dec. 1935 when he appears on the roster of an old timer’s team playing against the town team that included his son and others of Charlie Jr’s generation. Charles Turner Sr. - WW1. Rumour has it that Charlie Sr. did not like girls playing on his backyard rink. If it is true that Charlie Turner Sr. was cool toward the notion of women playing hockey he was not in tune with the times. In 1918 the Federal Government of Canada granted women the right to vote. Perhaps it was in recognition of the powerful role women played in the war effort both overseas and on the home front. It was a signal that women were ready to step out of the shadows and they did so in spite of opposition. They challenged dress codes, smoked and drank in public and wore short hair. Jazz and the fox trot were in vogue. 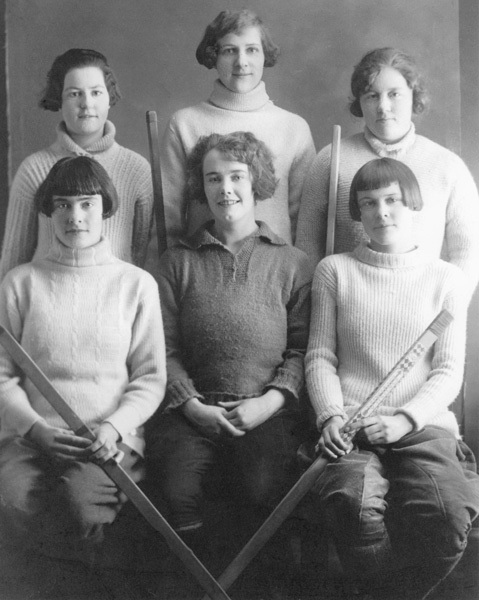 Participation in hockey was another frontier that women breached during this period and while they were and still are far from obtaining equal rights with men in hockey they jumped over the boards of rinks in hockey gear not just figure skating outfits. Unfortunately not much is written about them but the first record of a women’s hockey team in Grande Prairie appears in 1925 and then again in 1929. Hilda Clifford, the first white child born in Grande Prairie was one of the players on this first women’s team. They were trailbreakers for one of the greatest rivalries in the sports today: Canadian versus US Women in Hockey. Along with Bert Bessent and Charlie Turner Sr. Hockey Legend Max Henning’s father, Leonard Henning played an important role in the development of hockey in Grande Prairie. Leonard was an elevator operator in Lori Saskatchewan and in 1928, when Max was four years old his Dad was transferred to Grande Prairie. Max was among the kids in the neighbourhood who learned to skate and play hockey on the Turner back yard rink. He looked up to Charlie who was seven years older and undoubtedly learned from him. Although Leonard appeared on the old-timer roster along with Johnny Macdonald and Charlie Turner Sr. when they played exhibition games against their sons, Leonard’s sport was not hockey but speed skating. It is reported that the prize for winning a race when he competed at an event in Ontario was a sack of apples. Leonard was the first President of the GPAA and for many years Bert and Leonard were like a tag team taking turns as President. Throughout this entire episode their names appear in various hockey leadership roles they occupied. They eventually passed their torches to the next generation in the mid forties that marks the end of this episode but not before they had established a firm foundation for the game. When Leonard retired from active roles in the GPAA and his grandson was playing hockey he could be seen admiring Cam’s performance from his chair behind the screen at the end of the rink. Stan Neufeld and Cam Henning were defense partners. 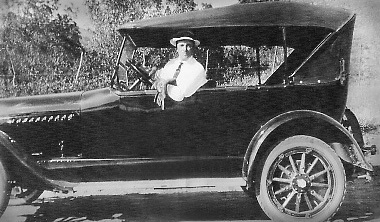 Leonard Henning in a democrat and a 1920’s vintage car. Other names that deserve to be recognized for their contributions as volunteers during this period include Frank Edmundson, Jack Crummy and Johnny Macdonald. Hockey Legend Duke Edmundson who played in the NHL came by his hockey skills honestly. His father Frank was a star player and playing coach for the Grande Prairie Red Devils in its early years. After Frank retired from the game he continued to coach and serve in various administrative roles that supported hockey in town. Jack Crummy, who is remembered mostly as a referee was another faithful volunteer during this period. He owned the Chrysler Plymouth Dealership in town located in the building now occupied by Menzies Printers. Jack often travelled with the team using his car to transport senior players from town to town before buses were chartered or when the team was unable to afford a bus. He held a whistle at away as well as home games. At a season ending banquet in 1945 toward the end of Jack’s active involvement as a referee he was on the program. His speech was entitled “The Trials and Tribulations of a Referee.” Undoubtedly he had some tales to tell that would rattle the imagination of referees today. During this era, Johnny’s name is associated principally with peewee hockey whereas Bert Bessent and the volunteers he mobilized worked at the midget level and were known as Bert’s Midgets. Johnny’s Peewees and Bert’s Midgets often entertained the crowd between periods at senior hockey games. One name stands out as an early player and bears witness to the certainty that although it may not have been well organized nor well documented the game that is very much a part of our national identity has continuity from Grande Prairie’s earliest beginnings to the present. If Francis Donald, born in 1908 were alive today he would be 108 years old and could give us first hand accounts of hockey in its infancy. Until Stan Neufeld came across information regarding Francis Donald it was thought that Pete Wright was the first hockey player to leave Grande Prairie and play as a professional. Clearly that distinction belongs to Francis Donald, the son of Frank Donald, a well-to-do businessman who owned a thriving construction business and had considerable real estate holdings in Grande Prairie during the 1920s – 1940s including the Donald Hotel. He tipped the scales at 180 pounds, played with the Grande Prairie Maroons, a team sponsored by his Father and was considered to be “one of the fastest and cleanest players in the Peace River country.” How he was discovered by the Black Hawks is unknown but early in October, 1931 he left Grande Prairie to join the Hawks in Pittsburgh for their fall training camp. Without playing time and competition in Grande Prairie to hone his skills it is not likely that Francis could have achieved the level of skill required to garner the attention of the Black Hawks. That suggests that during his youth a respectable level of hockey was played in Grande Prairie. The details are not known but a year after leaving home, (Oct. 6, 1932) the Herald reported that Francis had received a “raw deal” from the Black Hawks and following a season of baseball in Oshawa, Ontario he signed a contract to play hockey with Duluth, Minnesota. How Francis fared in Duluth is unknown as nothing further is reported concerning his fortunes as a professional hockey player. At some point he returned to Grande Prairie to run the Donald Hotel. 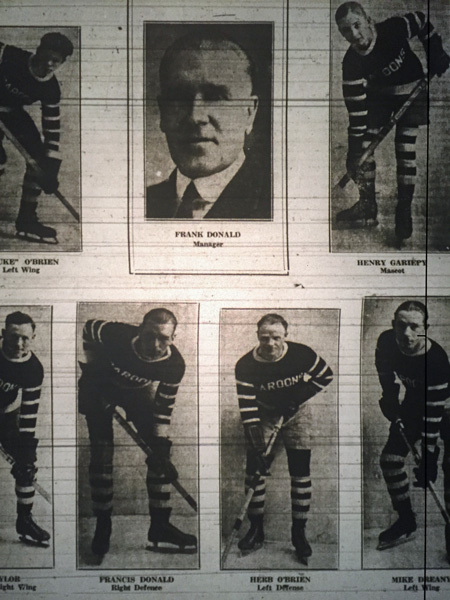 The last time mention of Francis Donald on the public record was Boxing Day, 1935 when his name appeared on the roster of a Grande Prairie old-timer team that was to play an exhibition game against the town’s senior team that included sons of the old timers. The Grande Prairie Old Timers included Johnny Macdonald, Charlie Turner Sr., Jack Crummy, and Jack Shields. Charlie Turner Jr., Roy Wright, Frank Edmundson, Rusty Black and Ken Crummy were teammates on the Town Team. There were skilled hockey players on the town team and given the opportunity at least two of them, Charlie Turner and Roy Wright could have played professionally. Coverage of the 1935 Boxing Day game was reported in the Tribune’s Dec. 26, 1935 issue. “The game was a real battle, in which close family relationships did not interfere with the will to win. The crowd went into roars of laughter when Ken Crummy rode his brother Jack to an inglorious fall. When young Charlie Turner came in contact with his Dad, Charles Sr., the crowd went wild.” Francis Donald was a “no show” for the game and there is no further mention of him or his involvement in hockey. As this story indicates, the history of Grande Prairie hockey is not neat and tidy. It seemed poised following the excitement generated by games between Grande Prairie, Lake Saskatoon and the boys from Peace River in 1914 to evolve into one or more leagues but that prospect was thrown off course by WW1. Following a brief recession and the Roaring Twenties it took almost a decade and another war to curb the devastating effects of the depression. Thankfully the Herald Tribune did not run out of ink during the depression and Billy Bessent and Max Henning have eagerly shared memories of their times. We are able to share and preserve tales of the Bessents, Hennings, Turners Macdonalds and others from this erea because we have access to these sources.